Please enjoy browsing through our products. You can search by clicking on the type of meat you want to use on the left or by clicking on the types of product you want to make across the top of this page. The main difference between sausage seasonings and sausage mixes is rusk. 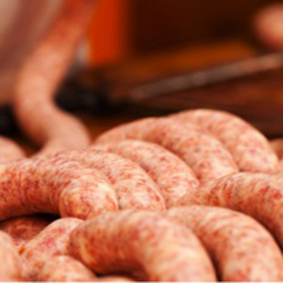 A 'sausage mix' is a complete sausage mix and is packed in 6x1.060kg in most cases. All you need to add is water and meat. A 'sausage seasoning' will require the addition of rusk, water and meat. Available in bulk buckets (15kg) or sachets (28x227g or 20x300g). Burger mixes are complete mixes and only require the addition of meat and water. There is no minimum order, but products are sold by the case. Orders of three cases or more are delivered free of charge within the UK. You can order through this website or call us on 01438 871967. Our philosophy is simple: source quality ingredients and blend them together to create seasonings with real character. Herbs and spices are natural ingredients with complex flavours and so are prone to change from harvest to harvest. Some companies try to standardise their ingredients by using oil extracts from herbs and spices. This approach means you don’t get the full flavour from the spices. We design our recipes using ground herbs and spices so you get that full flavour - the way nature intended. We then use our three generations of experience to carefully adjust recipes to account for the seasonal changes. So you get the same, full flavoured seasoning, every time.